AUT Millennium’s guiding principle is simple, “be the best you can be”. The organisation’s aim is to support and encourage the community, as a whole, to lead healthy, active lives and to excel and enjoy sport. There is one part of the facility where this is especially apparent. The 400m running track at AUT Millennium is a swarm of action from dawn till dusk. At any given hour, you will find individuals and groups working hard to achieve their own goals. From some of the nation’s elite sports stars, to members of the gym and school athletics days, the bright red track is used by a variety of people. However, there is one group in particular that has grown in strength since accessing AUT Millennium’s track. 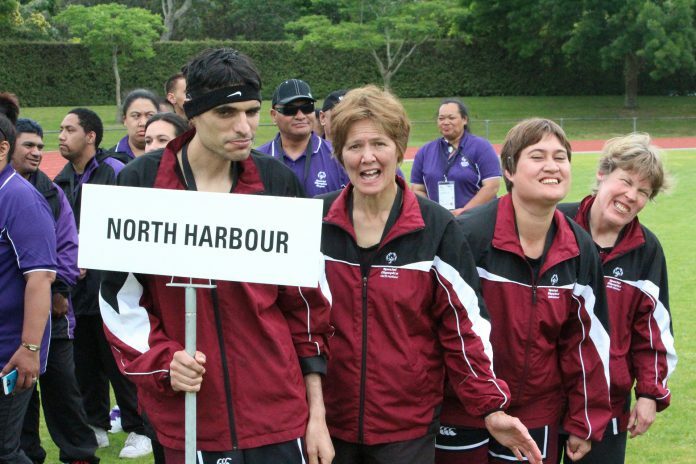 The ‘Special Olympics North Harbour’ group gather every Saturday over summer to train in a range of athletic disciplines and exemplify what sport is all about. Special Olympics North Harbour coordinator, Carolyn Pape, explains that the facility provides the perfect space for her group of athletes to develop skills and confidence. The sealed track means the athletes are able to run faster and continue to train regularly. The added benefit of a drainage system reduces the likelihood of the athletes slipping. “It gives them a lot of confidence being able to train at this kind of facility. We’re side by side with members of the public and we’ve had a few people ask what we do during sessions,” explains Pape. Dee Holdsworth-Perks, an employee at the Human Potential Centre at AUT Millennium, is a regular volunteer helping to train the athletes. Together, with her daughter Lucy, the pair have watched the group improve and grow personally. “The enjoyment and confidence the athletes get from learning new skills and building friendships is fantastic”, says Dee. The team started using the track in 2016 and since then the number of athletes has increased significantly. There are now around 12 athletes utilising the track every Saturday morning, including individuals between the ages of 40 and 50. It has had such an effect on the athletes that caregivers and flatmates are also using the time to improve their fitness by walking around the track while the group trains. “It means a lot being able to bring this group together every week. Everyone is committed to bringing the best out of each other”, states Pape. The sessions and facility provide an environment to promote fitness, fun and comradery. Carolyn explains that training together serves more than just a physical benefit to the team. Carolyn’s sister, Amanda, has made astounding progress since joining the group. At almost 120kg, Amanda began swimming with Special Olympics North Harbour. A year later, she joined the athletics group and now competes in power walking and is learning javelin. Amazingly, Amanda reduced her weight to 65kg, thanks to the regular group training sessions.